A new technology upgrade will allow hundreds of Cabinet social workers across Kentucky to spend less time on paperwork. Approximately 1,800 social workers and social services staff will receive tablets to replace their laptop and desktop computers. Cynthiana Elks Lodge No. 438 created gift bags to give to the inpatients at both Lexington VA Hospitals (Cooper and Leestown). A donation was given to the Elks by Carol Bennett to make the gift bags. 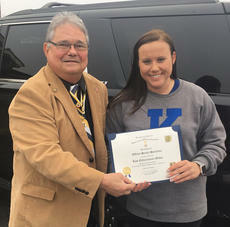 The donation was given as a memorial to her husband Doc Bennett who always wanted to help veterans and this was a way to remember him. 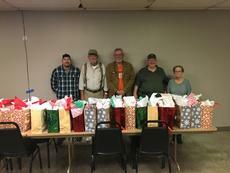 The Elks members who made the bags were: from left, Mike Crump, Steve Anderson, Jim Smith, Brian Kinney, Candy Hatterick and Rick “Hub” Fryman “ER”, (not pictured). The bags were given to inpatients on Christmas Day. “My houseplants look terrible,” is commonly heard during the winter months. Now is the time of the year that we spend more time indoors, with our houseplants; it’s also the time of the year that they look the most pathetic. Houseplants suffer indoors during the winter for various reasons. Shorter days that are often cloudy mean less light; low or no humidity in our heated homes; insects that thrive in these conditions; and bad watering habits. Harry Potter Treats and Horcrux Scavenger Hunt. Saturday, Dec. 29 at 4:30 p.m. at the Cynthiana-Harrison County Public Library for ages 11 and up (5th grade and up) are invited. Will partake in a visit from the Muggle Café, play trivia, and have other surprises in store. After the library closes for the day we will have a mini lock-in where we will have a horcrux scavenger hunt. Program will finish by 6:45 p.m. and all youth must be picked up by an adult by 7 p.m. Anyone wishing to participate in the program must arrive by 4:30 p.m. In celebration of the Winter Solstice the Romans celebrated Saturnalia, during which they would decorate homes and temples, feast and revel in honor of their god Saturn.